Mobile app that connects college-aged Third Culture Kids (TCKs) by allowing them to share stories in response to daily prompts. Watch the video above for a 2-minute overview. How might we help Third Culture Kids share their experiences so they feel less isolated when returning to the U.S. for college? Third Culture Kids (TCKs) are individuals who have spent their formative years in a culture that is different than that of their parents. Our project looks at American TCKs who grew up abroad - common examples are diplomat kids, military kids, missionary kids, or expat kids who move frequently due to their parents’ jobs. Cultureclub helps TCKs find a sense of belonging in college by connecting them with other TCKs. 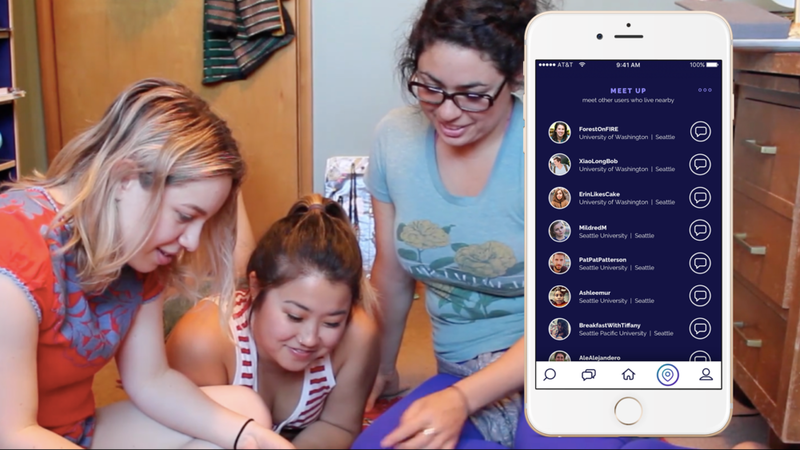 The app facilitates personal storytelling and local meetups. Daily prompts are fill-in-the-blanks. The user can answer with a short phrase or attach a longer story. Stories in the feed are curated based on the user’s current city and cities they have lived in previously. If the user designates an interest in meeting locally, the app will show local TCKs also interested in meeting. We conducted a literature review and five expert interviews. This helped us zone in on repatriation as a particularly difficult transition period that we chose to focus our efforts on. We asked nine TCK participants to share their experiences with repatriation. In each session, we collected in-depth positive, negative and “wildcard” stories related to returning to the U.S. for college. We collected broader demographic data from 69 respondents. Despite respondents having lived in the 54 different countries shown here in orange, unifying themes emerged. Insight: TCKs struggle to talk about their experiences with non-TCK peers, and frequently edit their story to make social interactions easier. Insight: For TCKs, the struggle with identity formation during college is compounded by conflicting cultural norms that surface during repatriation. Create a TCK community that is visible and accessible. Highlight the shared experience of repatriation. Provide TCKs with a foundation for self-reflective practices. We led ideation sessions and generated over 100 concepts. We eliminated those that did not tie back to our design principles, and sorted the remaining ones into themes. Focused on a TCK community. TCKs don't have trouble making friends any more than other college students do, but they lack that home base of people with similar experiences. Thus, we pivoted away from facilitating integration with non-TCK peers. Some ideas revolved around displays (maps, data visualizations, posters), but this involved a passive act of consuming information. We wanted to help TCKs dynamically share their own stories. A device that tracks emotions throughout the day and pairs with a phone app to share and view others’ experiences. TCKs encounter places near or on their college campuses that either prompt them to share a story or allow them to view and interact with stories other TCKs have left. Problems: Not a strong case for location-based element. Perks: Connecting over personal storytelling. A TCK-specific application that matches incoming freshmen with TCK juniors or seniors who act as mentors. Problems: Requires having TCKs on campus who are willing to mentor and other TCKs eager to seek help. Perks: Learning from those who have gone through similar experiences. A program that rotates a cohort of TCKs through four U.S. colleges for their first two years of education. Problems: A little too out there. Perks: Highly empathetic in creating a college program that more closely matches TCKs' lifestyle/upbringing rather than having them conform to the current system. We ultimately combined the reflective aspect, location-tied storytelling component, and notion of learning from other TCKs into one final concept: a mobile app where TCKs can share their unique experiences and connect over similarities. We had an abundance of feature ideas and needed to prioritize the leading set. Each team member scored features by assigning values of -1 to 3 (see legend below). 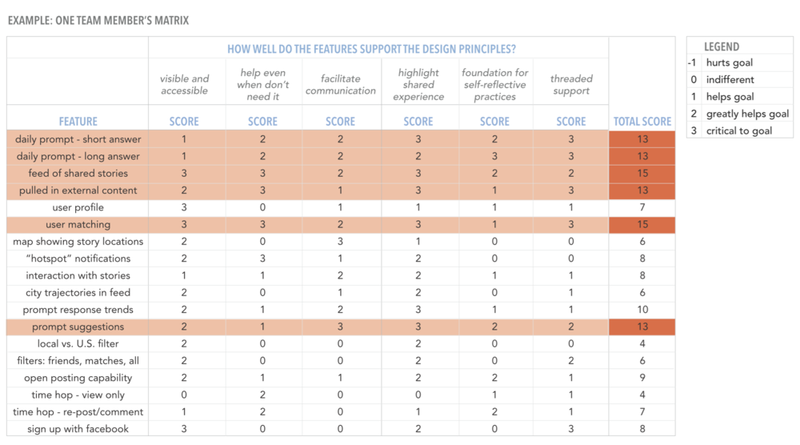 Each feature was evaluated for how well it supported our design principles. We then tested our concept with TCK participants, focusing on the features above. round 1: discovery phase - "What do we make?" For the first round of testing, we made a low-fidelity paper prototype. The goal was to get feedback on the concept itself rather than specific functionality. round 2: evaluative phase - "did we make it right"? For the second round of testing, we presented digital, clickable wireframes. The goal was to get feedback on the app's usability. A mobile app that connects college-aged TKCs by allowing them to share stories in response to daily prompts specific to TCK experiences. how is this different from other social media apps? Fill-in-the-blank style prompts give users a place to reflect on their own experiences and makes user generated content consistent. Prompts span from lighthearted to more serious. The examples on the left showcase real answers gathered from TCKs. Additionally, users can opt-in to meet other TCKs in their current city. Many students we spoke to felt like they were the only TCKs on their campus, but often times they are not alone. We wanted to create a space where a visible community could grow. Don’t be afraid to try out new research methods. We ended up creating a storytelling activity to include in our semi-structured interviews and came up with our own coding metrics. We realized this open-ended format best-suited our needs and was appropriate for our demographic. Externalize thoughts as much as possible. I am constantly trying to remind myself of this ideation session rule: if it’s not on a post-it or somehow recorded, it didn’t happen. Empathy goes beyond your users. While it's crucial to empathize with your target population, it's just as important to help your stakeholders understand the problem so they can help you succeed. This was extra-apparent with a lesser-known population (TCKs). Build a fully interactive prototype and conduct more evaluative testing. Think about the broader context of implementation, including business development, influencer recruitment, and marketing channels. Submit a proposal to speak about our concept at the 2018 Families in Global Transition Conference in The Hague, Netherlands. The theme is "Diverse voices celebrating the past, present, and future of globally mobile lives."